Most of these toggles are meaningless to beginners. The two important ones are semantic ("POSITION" and "SOME_MORE_DATA"), which is the variable name you’ll call on in shaders, and format (DXGI_FORMAT_R32G32B32_FLOAT and DXGI_FORMAT_R32_FLOAT), which defines how much / what type of data is associated with the named variable. You can name your vertex variables anything you want, but some names (such as "POSITION") are reserved and must have certain formats associated with them. In our pVertexLayout, the format for "COLOR" is 3 RGB floats — easy. "POSITION" is also 3 RGB floats — they’re actually going to be used as XYZ, the RGB nomenclature means nothing. "SOME_MORE_DATA" is just one float for playing with. Next, we’ll create the actual vertices to draw. It’s just going to look like raw numbers — only the pVertexLayout lets the GPU understand how to read the data. This is fairly simple, largely because DirectX does a lot of magic in the background. We define a vertex shader that receives a pre-defined VS_INPUT struct and outputs a VS_OUTPUT struct. That float myVal : SOMETHING construct means that we want myVal to magically receive the value SOMETHING that we define in our pVertexLayout description. That SV_POSITION in VS_OUTPUT means that it’s a SYSTEM VALUE. System values are hardcoded variables that get special treatment, and the ultimate vertex position is one such special variable. Then, SimplePixelShader will magically receive that information and return a color to draw to screen (by writing it in SV_Target — the special variable that stores a final color for this pixel). So that’s everything you need — you’ve defined what your vertices will look like, you’ve made some vertices, and you’ve written a shader to handle them and draw the triangle they form to screen. Now, you need to hook it all up. First, write a function to handle shader compiling. Note that the shaders.hlsl file we just wrote contains multiple shaders — a vertex shader and a pixel shader — and we’ll have to compile each separately. A lot of confusing toggles — par for the course. Pass in the path to shaders.hlsl in pFileURI, the name of the shader in pShaderName (i.e. 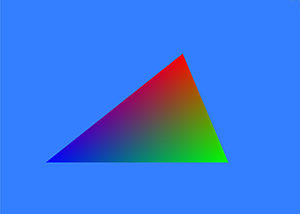 "SimpleVertexShader"), and the name of the shader model to compile against in pShaderModelName (use "vs_5_0" for compiling vertex shaders, and "ps_5_0" for pixel shaders). The ppOutBlob returned is a handle to the compiled shader. Close your eyes to everything else. Let’s use it to set up our vertex shader. So we use our new function to compile the SimpleVertexShader, we create a handle to the compiled code (m_pVertexShader) that recognizes it as a vertex shader, and then we tell our D3DDeviceContext to use it. Cool! Next, we call m_pd3dDevice->CreateInputLayout, to make the GPU aware of our pVertexLayout that we defined all the way at the top, and set it as our official vertex layout. Note that CreateInputLayout requires the vertex shader in addition to the vertex input layout — this is because it cross-checks the two to make sure pVertexLayout contains all the information m_pVertexShader asks for. Which, despite the line count, isn’t actually that scary! Our D3D11_BUFFER_DESC just says we want to allocate some memory on the GPU with size equal to the size of pVertexArray, to be used as a vertex buffer — it’s default behavior in every other way. Our D3D11_SUBRESOURCE_DATA tells the GPU where our vertex data lives on the CPU. We pass both structures in to m_pd3dDevice->CreateBuffer to copy that data to the GPU, then tell the GPU to use it as our VertexBuffer! And now, finally, everything is set up. In your Render loop, call m_pDeviceContext->Draw( 3, 0 ); to draw 3 vertices. And will you look at that. It took hours, but damn it, that is your triangle. This entry was posted in Graphics and tagged directx on July 27, 2013 by walkerb. Can’t we just use XNA? I think XNA still makes you worry about this stuff? But yeah, if you’re using something like Unity, this is too much detail. This level of granularity is useful for people who are more interested in making a game engine than in making a game. I was looking at some other tutorial about pipeline. The guy uses D3D11_CPU_ACCESS_WRITE for bd.CPUAccessFlags. He says that we need that so cpu can copy data from system memory to some buffer. That’s what I use. When I tried to set it to 0 I got access violation. Other than that, yours and his pipelines look quite the same. Are you sure “no CPU access necessary” ? Nvm, actually it is different. He is using context->Map(), memcpy, context->Unmap() and D3D11_MAPPED_SUBRESOURCE struct. Your method seems to be simpler (less code). I wonder what’s the important difference ?